Cleveland, Ohio – March 10, 2017 – John Fenn, co-founder of Budget Dumpster, one of the leading and fastest growing waste companies in the U.S., has been named to Waste360’s 2017 40 Under 40 awards list. The program showcases the next generation of innovative leaders shaping the future of the waste and recycling industry. The Waste360 40 Under 40 award recognizes inspiring and innovative professionals under the age of 40 whose work in waste, recycling and organics has made a significant contribution to the industry. The winners are involved in many different aspects including hauling, composting, policymaking and municipal initiatives. John Fenn will be formally recognized at WasteExpo, North America’s largest solid waste, recycling and organics industry event, May 8-11, 2017, in New Orleans. 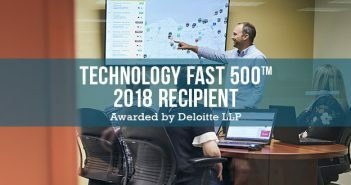 Based in suburban Cleveland with a growing team of over 70 employees, Budget Dumpster has been recognized as one of America’s fastest growing companies by the Inc. 500 (No. 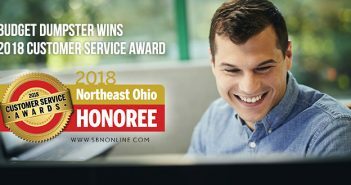 873 in 2016), one of the top five fastest growing companies in Northeast Ohio by Crain’s (2015, 2016), one of the largest waste and recycling firms in North America (No. 67 in 2016) and one of Fortune’s Most Flexible Workplaces (2016). 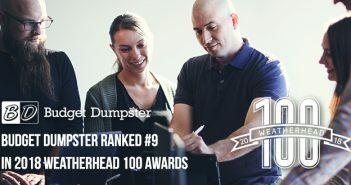 Learn more about how we help people and companies each day at www.budgetdumpster.com.